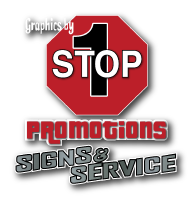 Get your name out there with personalized promotional materials and services from 1 Stop Promotions. We offer everything from custom signage, screen printing, banners, vehicle graphics and embroidery services to selling a wide variety of promotional items like hats, work wear, sportswear, pens, business cards, key chains and more. If you’re looking to outfit your staff with jackets, shirts and headwear or you’re a sports team in need of new uniforms or fundraising items, 1 Stop Promotions is the place to be. With a wide selection of brands to choose from, you can find just about any item for your event or business. Get in touch with 1 Stop Promotions for a quote.